Mobile Craft Buffet - Best Kids' Party Idea. Ever. For some parents, planning a child’s birthday party can be a blast while other mums and dads find the party planning process stressful and a chore. I belong to the second group. Because when it comes to a party, only a few rules apply: Plan, plan, plan - and then plan some more! There are loads of things to consider, ranging from the theme, food, guest list, decorations to the venue. Actually, those are the easy parts. What is usually difficult is settling on the correct entertainment to keep a group of (noisy) kids suitably occupied. Sure, there are the usual magic shows, face-painting or balloon sculptures but they may hold the children's attention span no longer than 30 minutes. The trick to keeping them entertained, as I found out during Ale's recent birthday party, is to just let them create something or anything freely with their hands and peace will reign. And all thanks to Lollibox's Mobile All-You-Can-Craft Party Buffet, the kiddos did just that! Yes, this is NO food party buffet. Instead, the All-You-Can-Craft Party Buffet is the ultimate fun craft experience for kids where they are able to pick from an astounding wide range of arts and craft materials and project ideas. All you have to do is to pick the package you desire, and EVERYTHING will be set up at your party venue! Clearly, bringing mobile crafty goodness right to your party's doorstep cannot be easier than this. Depending on the package you choose, the little ones get to load up their trays with up to 30 different materials, and having more than enough crafty goodies crafts to create! But just in case the kids need some inspiration, there are always sample crafts that will be displayed along side the craft buffet selection for them to refer to. Can I just say that it was the adults who ended up making the carrot plushie in the end... all because it was just too cute to resist! So was it any wonder that Ale (and her friends) could not wait to get started? Oh, and the craft buffet comes stocked with all art materials too - from colour pencils, crayons, magic markers to scissors and glue sticks... and wet tissues too. Seriously, all I did was just sit back and chill... and watch while the kids got down to work. And they sure did craft away. Even the brothers' fingers were itching to join in the fun! I saw a number of kids spending more than a few minutes staring at the craft buffet table... perhaps being overwhelmed by the number of craft choices. But that is always a good problem to have, no? 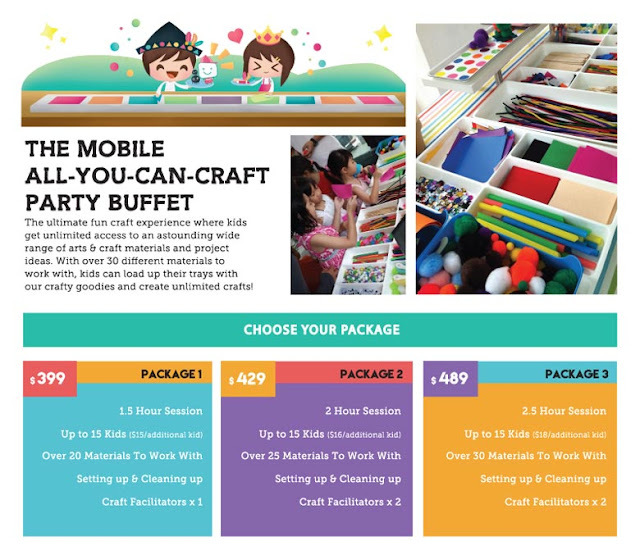 The fantastic thing about LolliBox's All-You-Can-Craft Party Buffet is each package comes with at least one Craft Facilitator who will be there for the entire duration of the party to guide the kids along. But from what I observed, parents ended up crafting together with their kids... simply because it was just too fun! So I guess it is safe to say that EVERYONE thoroughly enjoyed the 2-hour crafting session. Amazingly, all of the kids were kept occupied throughout the entire 2 hours and even when the time was up, some of them even wanted to continue! It is a good thing that Lollibox provides paper bags for kids to store their completed crafts... and unfinished ones, so that they are able to bring them home. And speaking of doing crafts at home, the Party Packs from Lollibox are also a great alternative to the usual party packs that are filled with candies and chocolates! Each party pack includes all the materials needed to complete the activities and craft projects, which had all the kids itching to get started almost immediately when I distributed them! There are 12 different themed Party Packs to choose from, which one can mix and match for orders consisting of 6 packs or more. There is also a soon-to-be launched 'Frozen'-themed party pack, which the girls at the party duly received. Frozen fever is showing no signs of going away so the Frozen-inspired crafts in the Party Pack were definitely a hit with the girls. The boys got the Stomp Stomp Dinosaurs Party Pack, where they had the chance to make their very own dinosaur fossils using the air-dry clay with the dinosaur figurines. A 12-piece marker set along with a movable dinosaur card rounded up the party pack. So if you are looking for a fantastic (and creative) party idea to keep the kids entertained, Lollibox's Mobile Craft Buffet and its Party Packs will present a novel kind of fun for everyone. Its wide array of craft materials will certainly guarantee everyone, including the adults, will leave with amazing memories of the birthday party! And me? I spare myself of all the planning. And did I mention that the cleaning up of the aftermath is taken care of as well? Note: Table for the craft buffet materials, and kids' tables and chairs are not included in the package. Rental of the craft buffet table is $50, while rental of the kids's tables and chairs start from $60, depending on the number of kids. That is the best part package every mom should have for their kids party. Being creative is fun, and what makes it more fun is the times to be spent with your kids and bond together. That's really sweet.